PuckSock™, a hockey training device, builds wrist and forearm strength providing quicker, stronger hands that increase the speed, power and accuracy of your shot. Use both off or on ice - either on your blade for warm-ups, or on your shaft practicing shooting and passing. 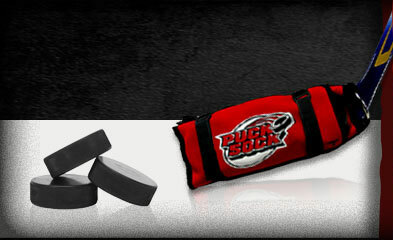 A variable weight system allows the PuckSock to hold up to six pucks providing a customized training solution for any player.